Welcome to the Henrietta Foundation, Henrietta’s land conservancy, devoted to making Henrietta a better and healthier place to live. Founded in 2000, the Henrietta Foundation Inc. is an all-volunteer, not-for-profit organization whose mission is to preserve and protect the scenic, natural, and recreational resources in the town of Henrietta, NY, for the public’s benefit. 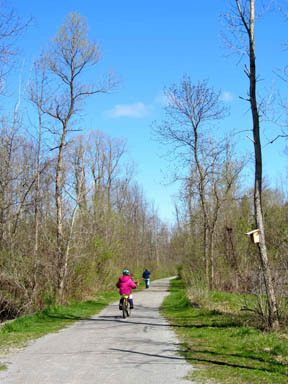 We manage and maintain the Lehigh Valley Trail’s north branch, which is handicapped accessible and open to the public. The Foundation is supported solely by membership contributions, grants, and in-kind donations. Because it is a 501 (c)(3) organization, gifts to the Foundation are tax-deductible to the extent the law allows (please consult your tax adviser). For more information about the Henrietta Foundation, how to join, or volunteer opportunities, contact us at (585) 334-1300 or e-mail info@henriettafoundation.org.